Today you will board a plane bound for China, where you will witness the vicissitudes of China’s five thousand-year history. Your tour will begin in Shanghai, the largest city in China. 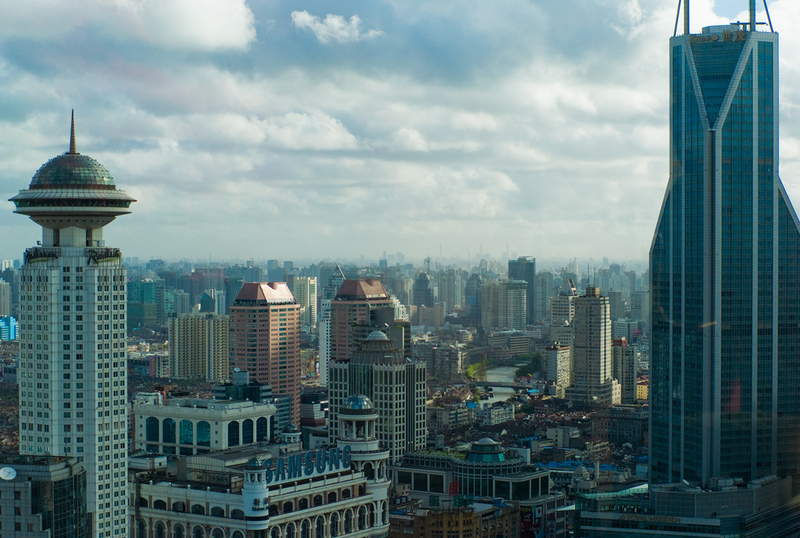 Today, after arriving in Shanghai, you will be greeted at the airport by CIT’s professional bilingual tour guide and escorted to the hotel where you will be staying overnight. Today, after breakfast, you will visit Zhouzhuang, a famous “water village” built around a series of canals, with buildings dating back to the Ming and Qing Dynasties. Like flipping through a series of well-preserved old photos, walking through Zhouzhuang will give you an intense feeling of nostalgia. You will also tour the village via a traditional gondola-like boat and savor the poetic atmosphere of life along the canals. Lunch will consist of local family-style dishes made with food produced by the area’s farms, whose fields are rich and fertile. The dishes you will sample include the famous “Wansan pig trotters” (Wànsān Tí) and a freshly picked local vegetable called “Āpó Cài,” which might be translated as “Grandma’s greens.” Afterward, you will proceed to Suzhou to visit another place rich with poetic atmosphere: Cold Mountain Temple (also called Hanshan Temple). Then you will tour the Humble Administrator’s Garden, one of the most famous of Suzhou’s traditional gardens and a UNESCO World Heritage Site. 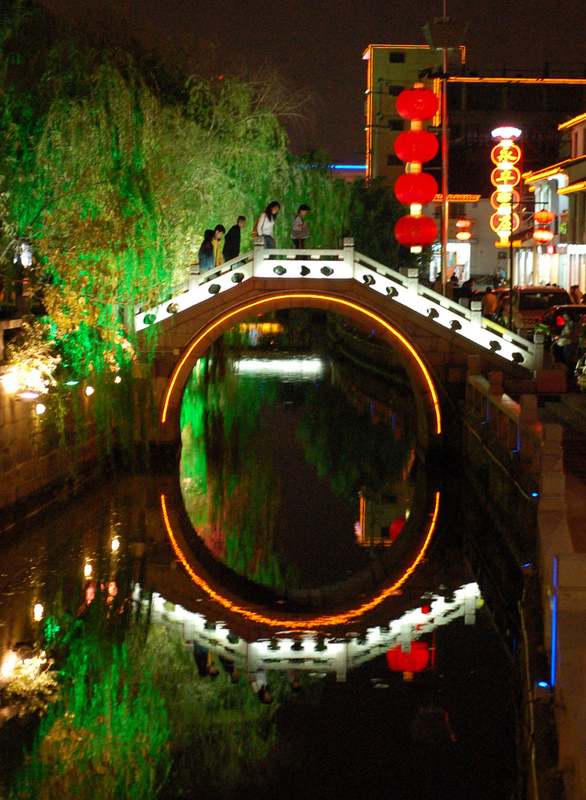 Finally, as evening approaches, you will have some time to relax at Shantang Street, an old-style street lined with traditional houses and featuring a picturesque canal. There you can enjoy a boat ride on the canal and take in a distant view of Tiger Hill, with its famous leaning tower. Your dinner will feature authentic Suzhou cuisine, famed for its simple yet delicately flavorful character, and Suzhou-style cake, sweet and delicious but not greasy. After breakfast, you will proceed to the prosperous city of Wuxi. There you will tour Xihui Park, the location of the Hui Mountain Spring, traditionally considered the “second best spring in the world.” Xihui Park offers a distinctive synthesis of serene mountain forest scenes, cultural relics and attractions, and leisure activities in one expansive park. At the summit of Xihui Park’s West Hill stands the iconic Dragon Light Pagoda, a seven-story tower that affords a magnificent view of the park, the city, and nearby Lake Tai. For lunch you can dig into some authentic Wuxi spareribs and sample the cuisine unique to the Lake Tai area, including a shrimp dish whose light seasoning allows you to savor the shrimps’ own natural flavors. Afterward you will visit Three Kingdoms City, a re-creation of a Three Kingdoms-era town featuring architecture, costumes, and performances from the 3rd century A.D. Then you will take a boat tour of Lake Tai, which is the most iconic symbol of Wuxi and is also famous for its pearls. Finally, you will head to Hangzhou, where you will enjoy a dinner featuring Hangzhou-style “red clay pot” cuisine. Hangzhou’s cuisine has a distinguished status among China’s regional cuisines, and we have arranged a meal that will delight your senses. It would be difficult for you to reproduce these dishes in your own kitchen, so be sure to bring your appetite and take full advantage of this opportunity! 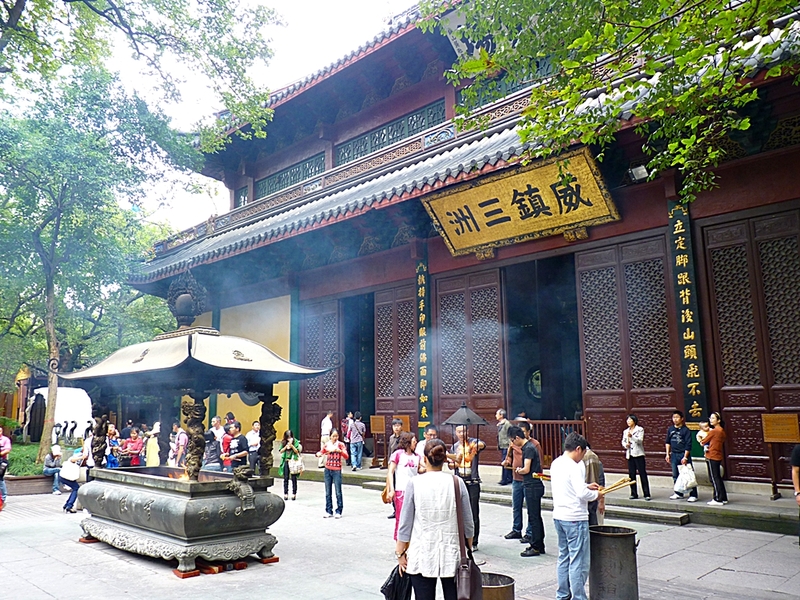 In the morning you will tour Lingyin Temple, which according to legend was originally built by a Buddhist monk from India. The legend also says that Feilai Peak (“Peak Flying from Afar”), just across from the temple, was transported through the air to the site directly from India. Next you will visit the opulent Residence of Hu Xueyan. Built with an enormous sum of money by a 19th-century pharmaceutical magnate, it has been called “China’s Number One Mansion.” The iconic West Lake is Hangzhou’s most famous attraction. We have made special arrangements for you to take a relaxing boat tour to enjoy the scenery of West Lake, which is bounded on one side by a modern downtown area and on the other sides by the natural beauty of Hangzhou’s hills. 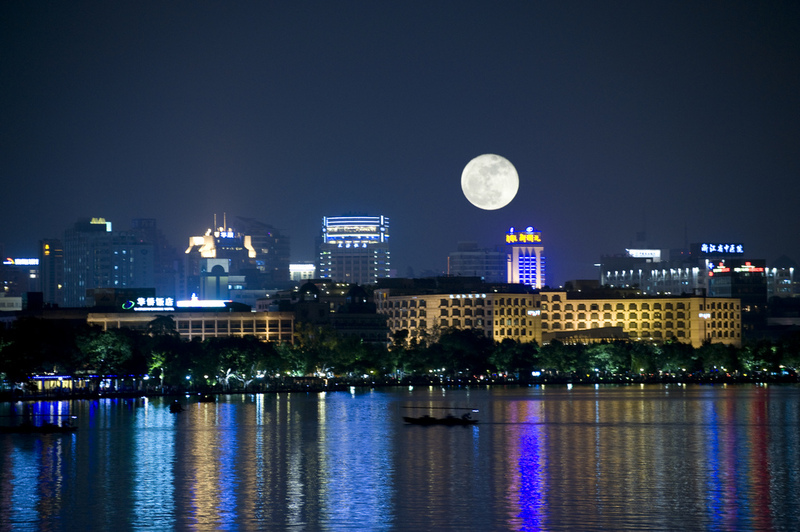 This scenery is one of the main reasons for the Chinese expression “Up above, there’s Heaven; down here, there’s Suzhou and Hangzhou.” We have also set aside plenty of time for you to walk along the shore of West Lake and take in its many famous sights, such as Red Carp Pond and Liulang Wenying Park. Your meals today will feature world-renowned Hangzhou dishes such as “West Lake Vinegar Fish,” “Dragon Well Shrimp,” and duck stewed with bamboo shoots. After breakfast you will head to Huangshan. 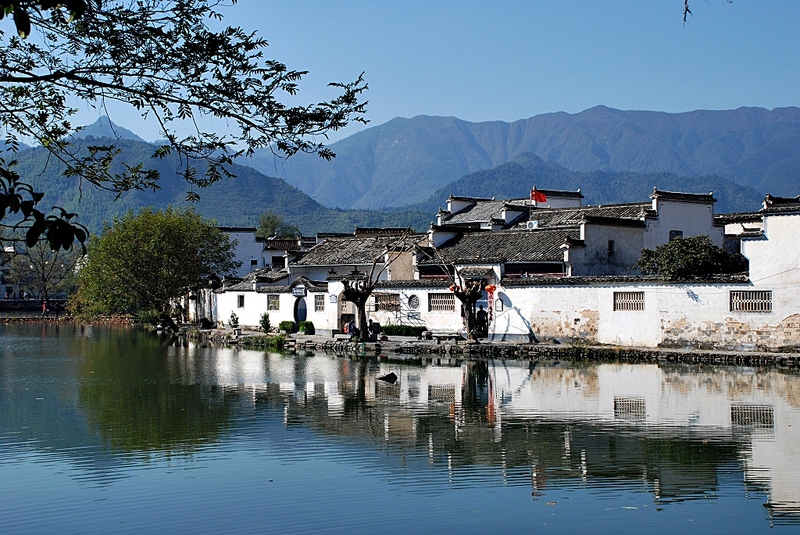 First you will visit Anhui Province’s famous Hong Village, which was built in 1131. Laid out in the shape of an ox, Hong Village is considered by many to be the most beautiful village in China and has been called “the village of Chinese paintings” because of its oft-painted scenery. For its beauty and history, it has been recognized as a UNESCO World Heritage Site. After your tour of the village, you will have time to rest in preparation for tomorrow’s trip up to the top of Yellow Mountain. Your meals today will feature the Huizhou-style cuisine eaten in the Huangshan area. Traditionally considered one of China’s “eight major cuisines,” it is said to be so delicious that tasting just one or two dishes will make you wish you were from Huizhou. Its apparent simplicity is belied by the range of colors, aromas, and flavors found in Huizhou cuisine. The dishes you can enjoy today include smoked duck and Huizhou-style glutinous rice balls. Today you will take a gondola (cable car) to the top of Yellow Mountain. The incomparable majesty of Yellow Mountain is described in the writings of Chinese thinkers and expressed in ancient sayings. Yellow Mountain’s natural scenery, including exotic pine trees, strange rock formations, a “sea of clouds,” and hot springs, makes it truly special. 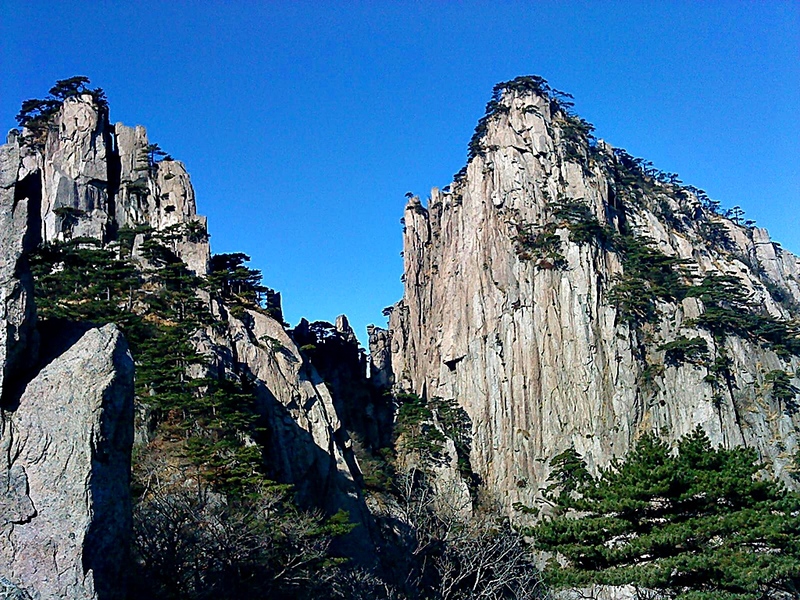 There are no less than 72 famous peaks in the Yellow Mountain area, each of them unique in appearance. Its three most famous peaks, Heavenly Capital Peak, Lotus Flower Peak, and Bright Summit Peak, all rise to an elevation of more than 1,800 meters above sea level. 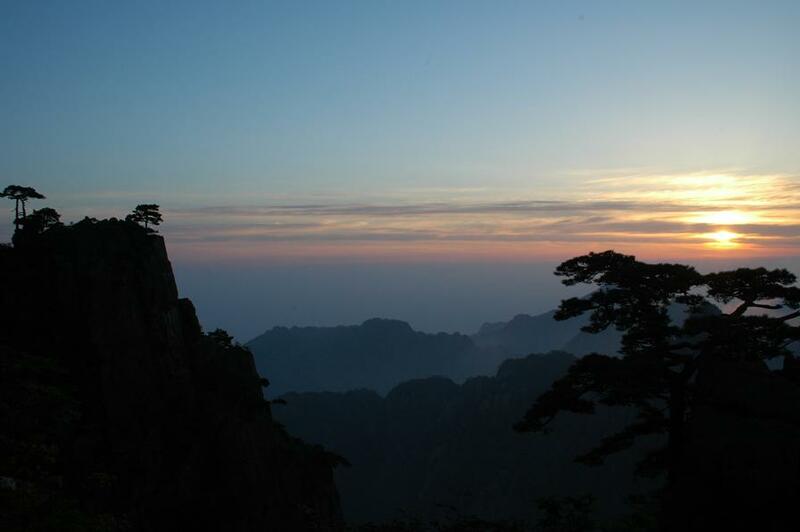 In addition to its numerous peaks, Yellow Mountain’s clouds are a major aspect of its beauty, and people who visit Yellow Mountain invariably say that the most striking views are from the highest peaks when there are clouds and mist. Today’s meals will include local dishes such as mountain-grown “tree-ear” (mù ér), renowned for its nutritive power, and chicken stewed with wild mushrooms. Due to the remote location of Yellow Mountain’s summit, the selection of dishes available today may lack the variety of the cuisine you will eat elsewhere, but we will ensure that your meals include only the freshest ingredients, and the experience of dining in this picturesque mountain setting is uniquely enjoyable. Early in the morning you can stop and appreciate the endless variety of atmospheric phenomena that accompany sunrise on Yellow Mountain, after which you will return to the hotel to enjoy breakfast. After breakfast you will enjoy more of the many spectacular sights Yellow Mountain has to offer, with names like Bright Summit Peak, Flying Rock, Lion Peak, Echo Cliff, Wall Hanging Pine, Black Tiger Pine, Beginning to Believe Peak, and Refreshing Terrace, the views from which will make you wonder whether you have entered a fairytale world. As the name “Beginning to Believe Peak” suggests, a visit to Yellow Mountain will change your outlook on the world. Afterward, you will take the gondola back down the mountain and then board a tour bus for the trip back to Shanghai. Upon your arrival, to help you recover from your journey, you can enjoy a delicious meal of local Shanghai cuisine, which, like Shanghai itself, combines many different influences into a unique style that seems to suit the tastes of just about everyone. The dishes available tonight include smoked fish and “drunken chicken” (zuìjī). After breakfast, you will head to the Old Town area (also known as Old Street) to visit Yuyuan Gardens and the Temple of the Town Gods Shopping Center. Here you will find goods of every description, including artworks, jewelry, clothes, snacks, souvenirs, toys, and special folk handicrafts. For lunch today, you will have a meal of Shanghai-style dimsum, featuring popular dishes like pan-fried steamed buns with meat filling and jujube cake. 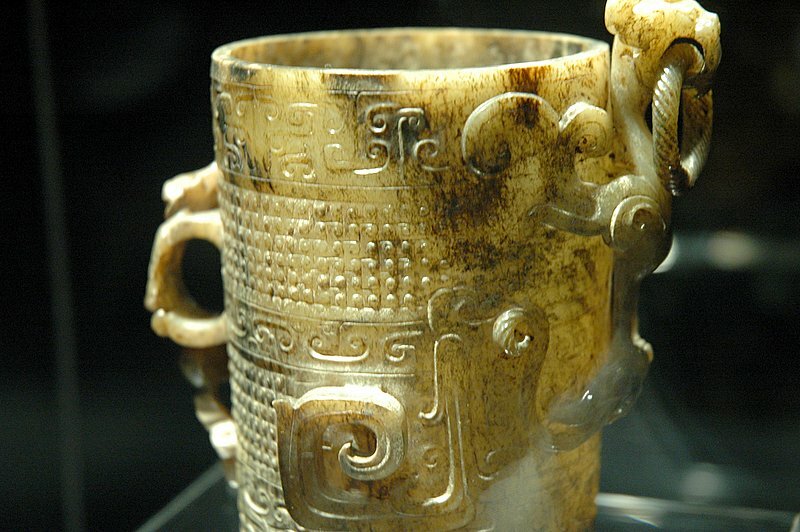 Afterward, you will tour the Shanghai Museum, whose artworks and artifacts are appreciated both within China and internationally. For dinner we have arranged a night of authentic Shanghai dishes at a famous local restaurant, including flash-fried river shrimp, sweet-and-sour spare ribs, and “Eight Treasures” (Bābǎo Jiàng). You won’t find these dishes prepared this well anywhere else! In the evening you will enjoy a mesmerizing performance by a famous Shanghai-based troupe of acrobats.